This post from the archives is reposted as part of the Blast from the Past series. New content will return October 3, 2013. Patchwork Quilts remain a rich source of inspiration of design in all kinds of media, needlepoint not the least. Every time I look at a quilt book, any quilt book, I find lots of ideas for new projects. And I’m not alone in this, many other needlepoint designers do as well. I thought on this sunny (at least here) spring Friday I’d share some of the many quilt-inspired posts and projects you can find here at Nuts about Needlepoint. First off, we have the Pyramid mini-sock post from earlier this week. 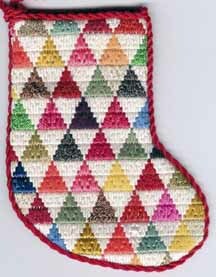 Based on a traditional quilt block, Thousand Pyramids, and designed by me in about 2003, this design is one of a series of Scrap Bag Needlepoint ™ mini-socks. The Sunbonnet Sue mini-sock remains one of my favorites. 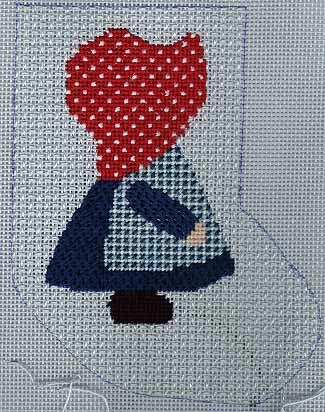 Sunbonnet Sue has been so popular as a quilt pattern that there are whole web sites devoted to her and her friends. If you wanted to you could use these blocks as inspiration for a whole series of needlepoint designs. 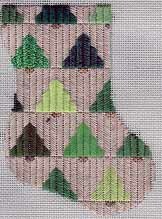 The Pines Trees mini-sock is based on a lovely tradition, that of the Christmas quilt. These quilts, often having pine trees as a motif, are used only during the Christmas season. I like this pattern better than many other Christmas quilts because it’s quiet beauty fits in so many places. The Sunburst Mosaic Pattern is also based on a quilt pattern, this one called Sunburst. 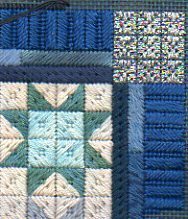 It’s related to the lovely (and easy to vary) Log Cabin quilt patterns. Another three-part project based on a quilt is Winter Stars. 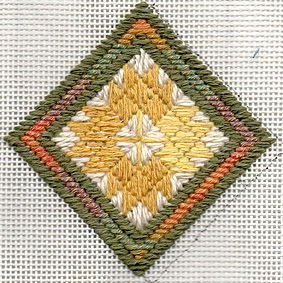 A Scrap Bag Needlepoint ™ project, this design uses a monochrome palette of blues, blue-violets, white, light blue, and gray. It uses Genny’s Scotch in an eight-pointed star pattern for the blocks and has a variety of unusual borders. You can get all three parts on Nuts: Part 1, Part 2, and Part 3. 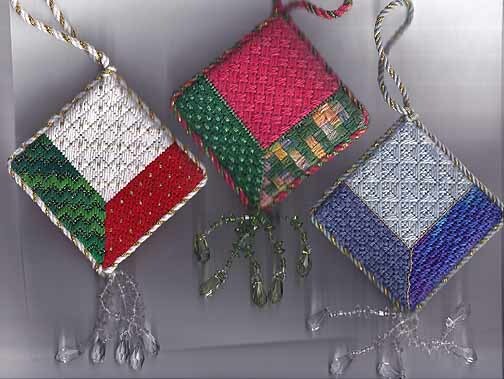 Quilt Blocks have also inspired several tiwnchies, that have patterns on the site including Stepping Stones, Independence, and Christmas Leaves (pictured above). There are also some quilt-inspired patterns I’ve designed on other sites. This leaf block is available from my friend Kristen’s site Craft Leftovers. 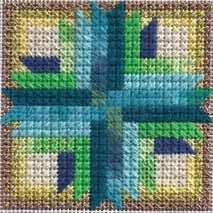 Along with these many free patterns, several of my ebooks are based on quilts, including Maple Leaf Rag, Attic Windows, the heart samplers, and 50 Patchwork Patterns. All if these are available in my on-line store. I designed my own needlepoint piece based on the “Lawyer’s Puzzle” block. In my head, floating around and not quite landing where it needs to land, is a design that would incorporate Lawyer’s Puzzle, Courthouse Square, Courthouse Star, and Courthouse Steps in one piece. Then it will hang in the law office where I work. My biggest stumbling block is on the design that would separate the 4 blocks. So many ideas, just can’t decide on one.